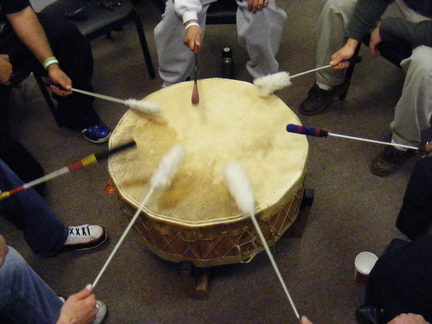 Drumming is part of the festivities at the New Year’s Eve Sobriety Pow Wow. More than 3,000 people are expected at the Oregon Convention Center for Thursday’s 24th annual Sobriety Pow Wow, one of the city’s largest and longest-running holiday events. But its organizers aren’t surprised if you haven’t heard about the party — which they expect to be the area’s biggest clean and sober New Year’s Eve celebration. Founded in 1970 as an outpatient substance-abuse treatment center, the nonprofit agency has grown to include residential treatment and family resource programs as well as a primary care health clinic. The powwow is being billed as the kickoff to NARA’s 40th anniversary. The first of those foundations is addressed with a cornucopia of cultural activities. Archambault, a member of the Lakota Sioux Nation, presides over the event as master of ceremonies. Ed Goodell is what’s called “whip man,” whose ceremonial duties include preparing the dance floor by smudging sage, sweet grass, flat cedar and juniper. There’s a color guard and “grand entry” processionals to honor those in NARA’s residential family treatment center. There are children’s games and more than 50 vendors selling crafts, Indian tacos, fry bread and cookies. Most important, there are drums and dancing. NARA All Nations Drum serves as the host ensemble, but the open-door policy prevails. Bagpipers? You bet. Native culture may be the powwow’s main tool, but the goal is helping people in the community, so everyone is invited. Buser, of Chickasaw descent, started that learning in 1992, when he entered a NARA drug and alcohol treatment program. He later went to work for the organization and, through the years, progressed from cook to director of its treatment programs. “I came in here and had no knowledge of my history,” he says. “The transition from living on the street, robbing people and hurting people to living clean and learning about the culture — that’s huge. That’s just the sort of success story that Archambault, himself sober more than 30 years, believes the powwow and other such activities make possible.